It doesn’t matter what specific cause your nonprofit supports; you have bottom line objectives you are working to achieve. Whether you are fundraising or promoting a petition, social media is a useful tool to reach your audience. While the mechanics of Facebook seem simple enough, being strategic about how you develop and post content will help you effectively communicate with your audience and reach your goals as a nonprofit. 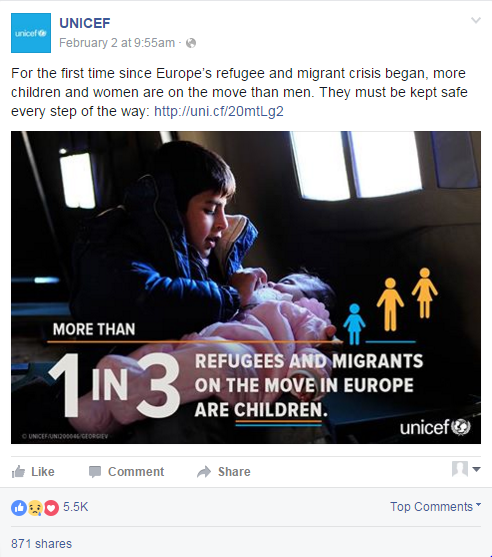 We pulled some of our favorite nonprofit Facebook posts that do an awesome job at promoting calls to action. These are excellent examples of how to engage your audience by including that little something extra. People love stories; especially ones that have those happy, feel-good endings. Psychology Today notes that the strength of stories lies in the fact that they include both emotion and fact. 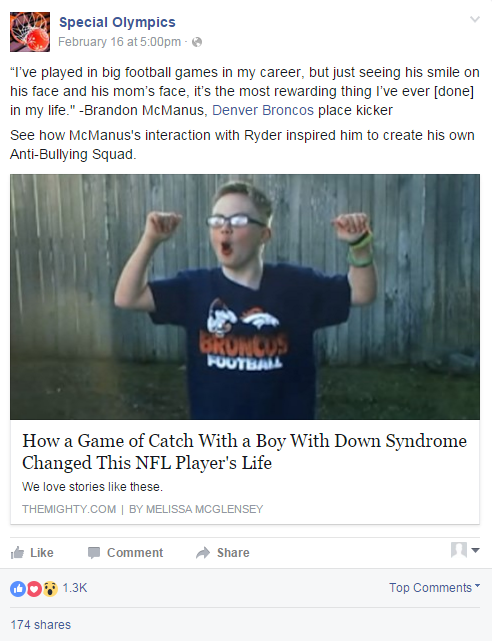 When you combine these two, you can engage the audience’s imagination to put them in someone else’s shoes; like in this story posted by Special Olympics of how an NFL player came to create an anti-bullying squad. Putting a face to your organization’s efforts is a great way to show your audience how your non-profitis helping real people. Plus if your story makes your audience feel good hearing about other’s involvement, they just might get involved too. Featuring stories of people that your nonprofit has helped really is the best of both worlds for your audience. It’s easy to type up a status with all the information you want your audience to know. But is that the most effective way to get your message across? Almost half of your brain is responsible for the processing of information visually, so why not try to communicate your message in an informational graphic like this one posted by UNICEF? These can be easy to make, and can stand out in the sea of text and articles flooding your followers’ news feeds. These types of images are different. They draw the eye to the text on the picture first, then to the photo itself, instead of relying on the caption to communicate the message to the audience. Just remember, captions are still a great tool to link to where your audience can find more information. 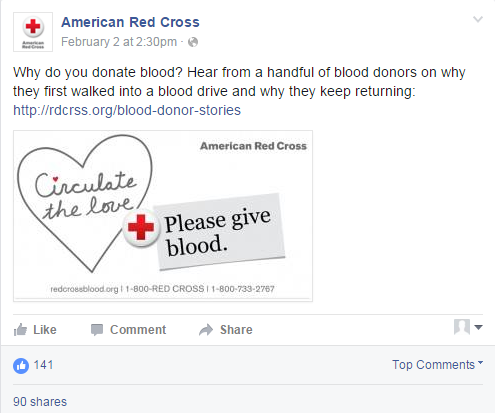 This post by the American Red Cross is a great example of presenting your audience with a clear call to action and a little bit of persuasion. If your call to action is something that your audience may have reservations about, like donating, personal stories come in handy again. Posting a link where your audience can read stories from people they can relate to can squash any fears they may have and bring them onboard. The American Red Cross did a great job of this by giving their audience a chance to hear about their work from someone outside of the organization with their stories from past blood donors. An entertaining video with a philanthropic back story? What could be better? Studies have shown that posts that either amuse or make audiences laugh are more likely to be shared, so if you can tack your nonprofit’s message on to a video that has gone viral, then you’re golden! 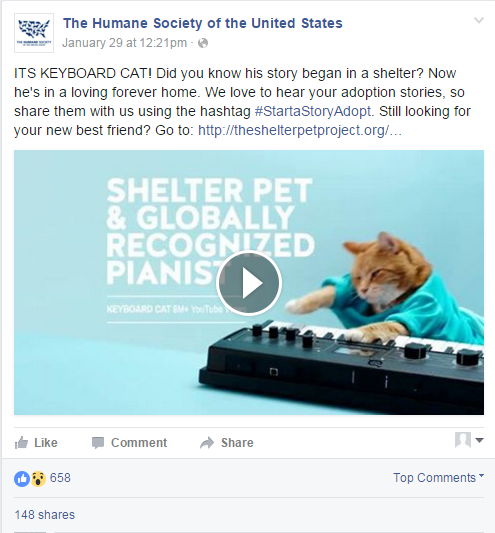 This post from The Humane Society about Keyboard Cat, is a great example of using entertainment to garner attention from your audience. Stay up to date with what is currently trending and find a way to relate it to your nonprofit. 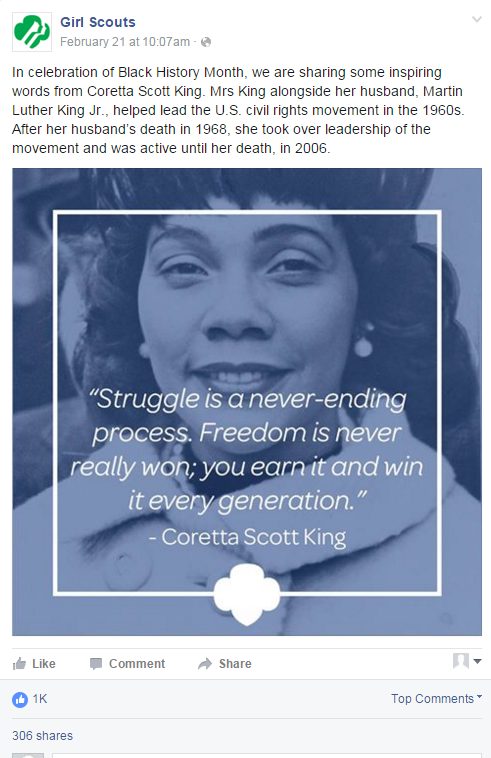 This post about Coretta Scott King from the Girl Scouts of America, celebrates both the achievement of an inspiring woman as well as Black History Month. Something that would have taken this post one step further would have been to jump in on a relevant hashtag or tagging someone influential and relevant to the cause. The more eyes that see your post, the better chance of increasing involvement.